Alexandra Otieva is one of the artists who shows a new face in every work. And this is due to the sharpening of the skills for once chosen creative manner. For Alexandra it is watercolour on a wet sheet. The artist from Nice has been mastering a complex technique for several years to implement any idea freely and creatively, but at the same time, on a high professional level. 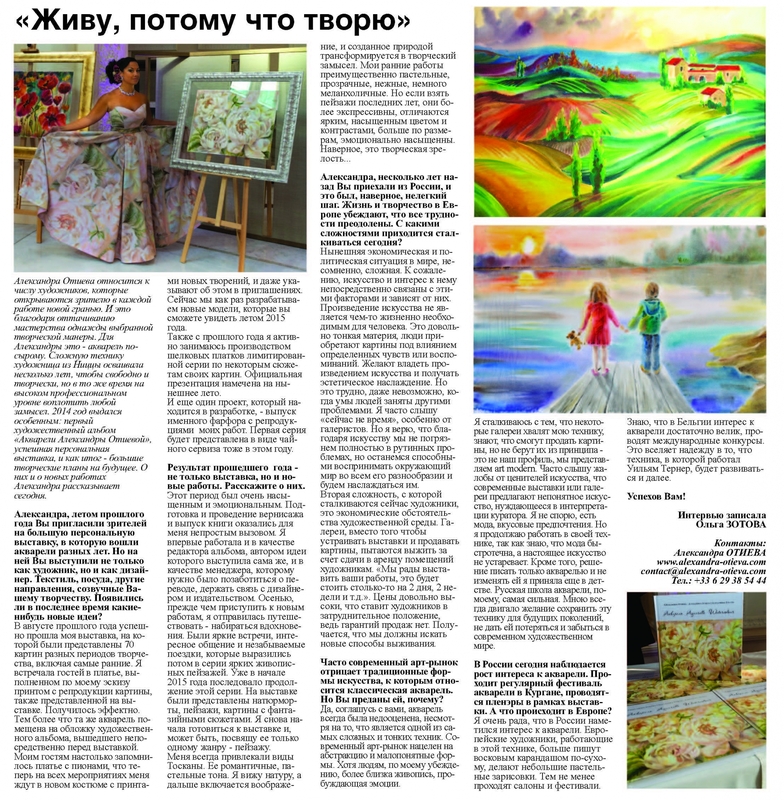 The year 2014 was special: there were the first art album "Watercolours by Alexandra Otieva", a successful personal exhibition, and as a result – great creative plans for the future. Alexandra will tell us today about them and about her new works. Alexandra, in summer last year you invited the audience to a large solo exhibition, which presented watercolours of different years. But you were present there not only as an artist, but also as a designer. Textiles, dishes, other directions suitable for your creativity. Are there any new ideas? My exhibition was successfully held in August last year, 70 paintings of different periods of creativity, including the earliest ones, were presented there. I met the guests in a dress made by my sketch, with a print from the reproduction of the picture also presented at the exhibition. 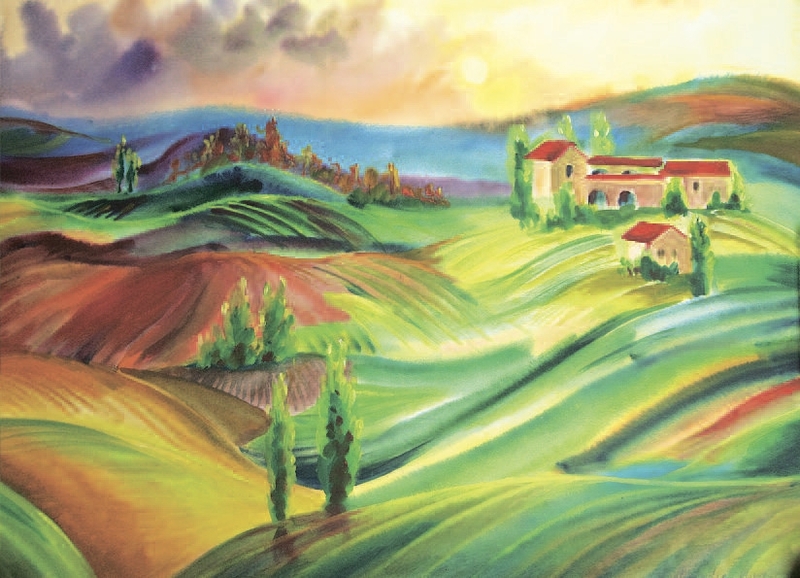 It turned out to be spectacular, especially because the same watercolour was placed on the cover of the art album which was released just before the exhibition. 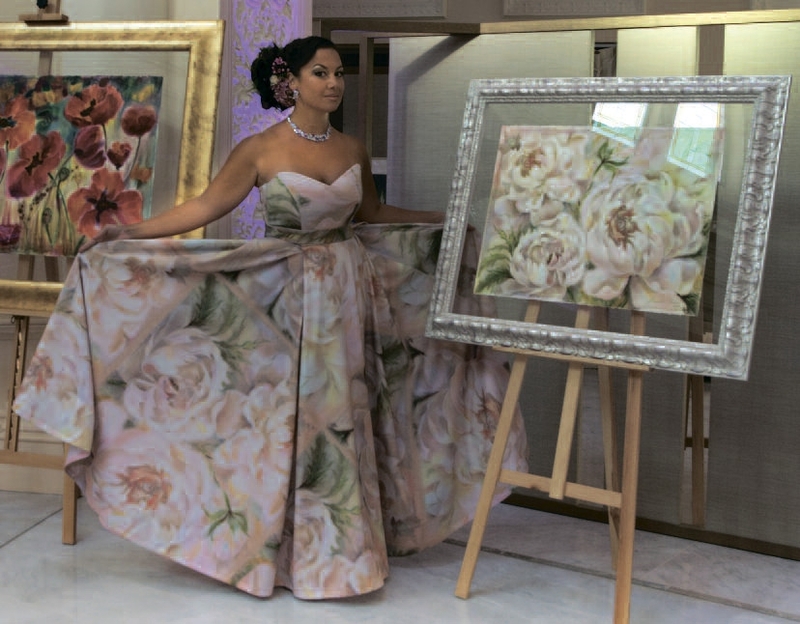 My guests remembered a dress with peonies, and after that I am expected to visit all the events in a new dress with prints, and it is even pointed out in invitations. Now we are just developing the new models that you can see in summer of 2015. Also since last year I have been actively engaged in the production of a limited collection of silk scarves based on some of my paintings. The official presentation is scheduled for this summer. And one more project that is under development is the issue of personal porcelain collection with reproductions of my works. The first series will be presented in the form of a tea set also this year. The result of the last year is not only an exhibition, but also some new works. Tell us about them. This period was very intense and emotional. 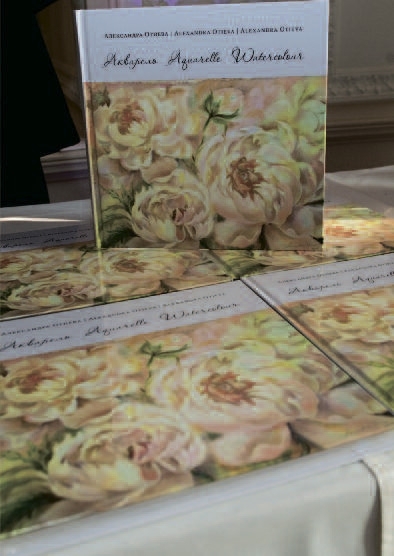 The preparation and vernissage itself, as well as the release of the book, proved to be a challenge for me. For the first time I worked as an editor of the album, anв yet I was the author of it, and as a manager who needed to take care of the translation, to keep in touch with the designer and the publisher. In the autumn, before I started my new work, I went to travel – to gain inspiration. There were wonderful meetings, interesting communication and unforgettable trips, which later manifested themselves in a series of bright scenic landscapes. Alexandra, a few years ago you came from Russia, and it was probably a difficult step. Life and creativity in Europe convince that all difficulties are far away. What are the challenges now? The current economic and political situation in the world is undoubtedly difficult. Unfortunately, art and interest in it are directly related to these factors and depend on them. A work of art is not something vital for a person. This is a rather delicate matter, people acquire pictures under the influence of certain feelings or memories. They want to own a work of art and get aesthetic pleasure. But it is difficult, even impossible, when people's minds are occupied with other problems. I often hear "now is not the time", especially from the gallery owners. But I believe that thanks to art we will not be completely immersed by routine problems, but we will remain able to perceive the surrounding world in all its diversity and will enjoy it. The second difficulty that artists face now is the economic circumstances. Galleries, instead of arranging exhibitions and selling paintings, try to survive by renting premises to artists. "We are happy to exhibit your work, it will cost so much for 2 days, 2 weeks, etc." Prices are quite high, which puts artists in a difficult position, because there is no guarantee of sales. It turns out that we must look for new ways of survival. Modern art market often denies the traditional forms of art, which include classical watercolour. But you are devoted to it, why? 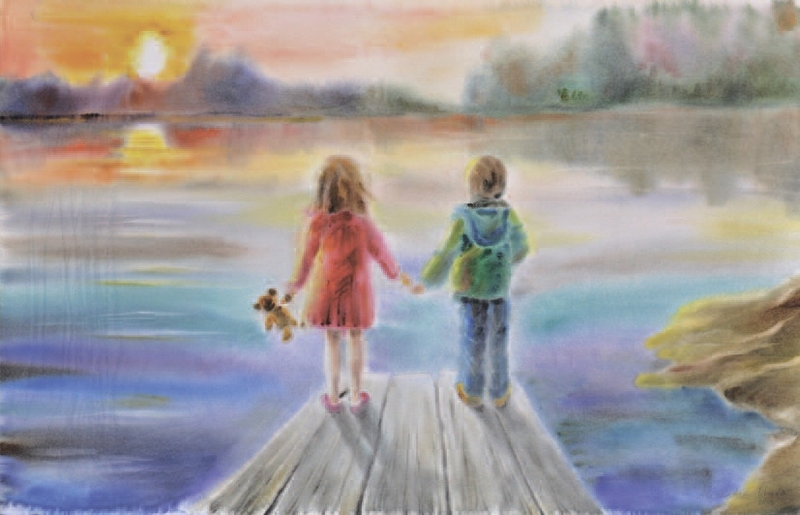 Yes, I agree with you, watercolour has always been underestimated, despite the fact that it is one of the most complex and subtle techniques. Modern art market is aimed at abstraction and obscure forms. Although the painting that awakens emotions is more familiar to the people. I come across the fact that some galleries praise my technique, they know that they will be able to sell pictures, but do not accept them out of principle. It's not our cup of tea, we exhibit art modern. Often I hear complaints from connoisseurs of art that modern exhibitions or galleries offer an incomprehensible art that needs to be interpreted by the curator. I do not argue with it, there is a fashion, or taste preferences. But I continue to work in my technique, because I know that fashion is ephemeral, and real art does not become old-fashioned. Moreover, the decision to use only watercolour and not to change it for anything was made by me when I was a child. The Russian school of watercolour, in my opinion, is the strongest one. I have always been motivated by the desire to preserve this technique for future generations, not to let it get lost and be forgotten in the modern world of art. Today in Russia there is a growing interest in watercolours. A regular watercolour festival takes place in Kurgan, open airs are held within the framework of the exhibition. And what happens in Europe? I'm very glad that interest in watercolours has become evident in Russia. European artists working in this technique, more often use wax pencil on a dry sheet, make small pastel sketches. Nevertheless, there are different exhibitions and festivals. I know that in Belgium the interest in watercolours is great enough, international competitions are held there. This gives us hope that the technique in which William Turner worked will continue to evolve.